Carbon–carbon bond-forming reactions are organic reactions in which a new carbon–carbon bond is formed. Electrophiles are reagents with positive charge or neutral species having a vacant orbital. Electrophiles are attracted to an electron rich centre. Nucleophile is a chemical species that has a free pair of electrons and in a reaction donates an electron pair to an electrophile to form a chemical bond. An aldol is a molecule that is both and aldehyde and an alcohol (this is the reason of the name), it is a hydroxy ketone or aldehyde. The aldol reaction happen between two carbonyl compounds to form a new β-hydroxy carbonyl compound. Diels-Alder reactions occur between a diene and a conjugated alkene to form a ring. In an addition of a Grignard reagent to a carbonyl group an alkyl is added to a carbonyl, using a Grignard reagent in the transition state. The Michael reaction or Michael addition is the nucleophilic addition of a carbanion or another nucleophile to an α,β-unsaturated carbonyl compound. The Wittig reaction or Wittig olefination involves an aldehyde or ketone with a triphenyl phosphonium ylide (often called a Wittig reagent) to form an alkene and triphenylphosphine oxide. Carbon–carbon bond-forming reactions are organic reactions in which a new carbon–carbon bond is formed. They are important in the production of many man-made chemicals such as pharmaceuticals and plastics. Electrophiles are reagents with positive charge or neutral species having a vacant orbital. Electrophiles are attracted to an electron rich centre. Usually in a chemical reaction they accept an electron pair when binding to a nucleophile. Nucleophile is a chemical species that has a free pair of electrons and in a reaction donates an electron pair to an electrophile to form a chemical bond. It can be also a part of a molecule. Some examples of reactions which form carbon–carbon bonds are aldol reactions, Diels–Alder reaction, the addition of a Grignard reagent to a carbonyl group, a Heck reaction, a Michael reaction and a Wittig reaction. An aldol is a molecule that is both and aldehyde and an alcohol (this is the reason of the name), it is a hydroxy ketone or aldehyde. The aldol reaction happen between two carbonyl compounds to form a new β-hydroxy carbonyl compound. The aldol reaction may proceed by two different mechanisms. Carbonyl compounds, such as aldehydes and ketones, can exists as enols or enolate. Enols are nucleophilic at the α-carbon so they can attack carbonyls (when protonated). This is the 'enol mechanism'. Enolates form if a carbonyl is deprotonated. are much more nucleophilic than enols or enol ethers and can attack electrophiles directly. The usual electrophile is an aldehyde, since ketones are much less reactive. This is the 'enolate mechanism'. Diels-Alder reactions occur between a diene and a conjugated alkene. They are cycloadditions: chemical reactions in which two or more unsaturated molecules combine to form a cyclic adduct. In this process there is a reduction of bond multiplicity: from 3 double bonds, only one remains in the product. The others are spent to form a ring. Two sigma bonds are formed in one concerted step. Diels-Alder product can be easily recognized since they are constituted by six membered ring with a double bond inside the ring and a conjugating group outside the ring on the opposite side to the double bond. In this reaction an alkyl is added to a carbonyl, using a Grignard reagent in the transition state. Grignard reagents are compounds formed by the reaction of magnesium metal with alkyl or alkenyl halides. They’re good nucleophiles and very strong bases. The Grignard reagent (nucleophile) attack the electrophilic carbon atom of a carbonyl group. The addition of the Grignard reagent to the carbonyl typically proceeds through a six-membered ring transition state. Organometallics are very powerful nucleophiles, and they are able to attack at the carbonyl group to form alcohols. 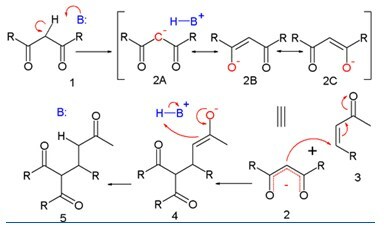 The reactions from Grignard organometallic reagents with carbonyl compounds are among the most important ways of making carbon-carbon bonds. The Heck reaction (also called the Mizoroki-Heck reaction) is a reaction where a substitued alkene is formed from an unsaturated halide (or triflate) and an alkene. The reaction needs a catalyst, usually a palladium nanomaterial-based catalyst. It is named after Tsutomu Mizoroki and Richard F. Heck (2010 Nobel Prize in Chemistry). It is a carbon-carbon bond-forming reaction of great importance, as it allows one to do substitution reactions on planar sp2-hybridized carbon atoms. The Michael reaction or Michael addition is the nucleophilic addition of a carbanion or another nucleophile to an α,β-unsaturated carbonyl compound. It belongs to the larger class of conjugate additions. This is one of the most useful methods for the mild formation of C–C bonds. Many variants exist. In every Michael reaction there are Michael donors, electron-withdrawing groups such as acyl and cyano, and a Michael acceptor, is usually a ketone. R and R' substituents are Michael donors making the methylene hydrogen acidic. In the presence of a base a carbanion is formed. The substituent on the activated alkene, also named as Michael acceptor, is usually a ketone making it an enone, but it can also be a nitro group. Structures between parentheses are three resonance structures, two of which have enolate ions. This can reacts with the electrophilic alkene 3. Depending on the relative acidities of the nucleophile and product, the reaction may be catalytic in base. In most cases, the reaction is irreversible at low temperature. This reaction is widely used for preparing alkenes. The Wittig reaction was discovered in 1954 by Georg Wittig, for which he was awarded the Nobel Prize in Chemistry in 1979.